Good documentation is vital to good clinical research. As the saying goes, “If it isn’t documented, it doesn’t exist”. In fact, one of the most common inspection findings in investigator site inspections is the lack of reliable, accurate, and adequate source documentation. Because we actively help over 4,500 research sites manage eRegulatory and eSource files electronically, we prioritize ALOCA-C standards, and additional European Medicines Agency (EMA) standards, in the way we design our platform, workflows, and SOPs – as well as the way we train research sites with managing documentation and certified copies electronically. When thinking ALCOA-C it first helps to have a clear definition of source data. 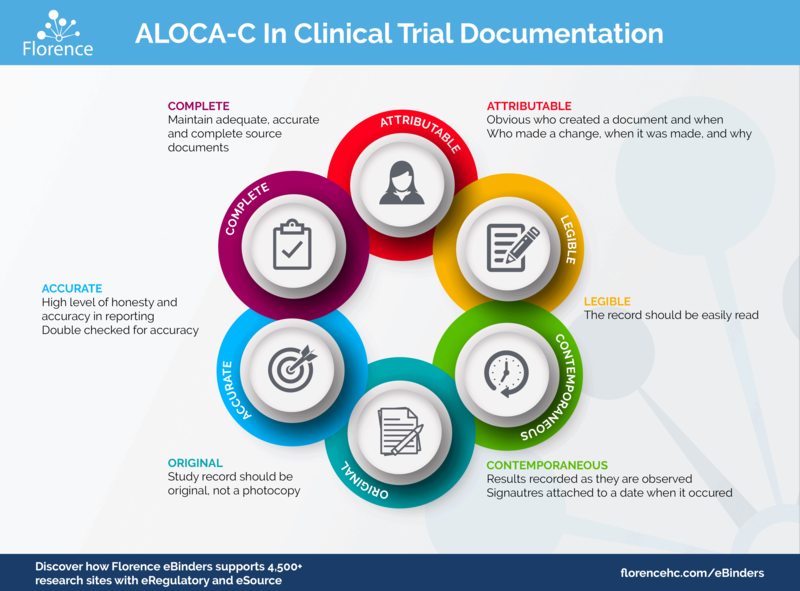 According to the FDA, source documentation in a clinical trial is any medical record or form kept for each participant – prior, during, and after the clinical trial procedure. 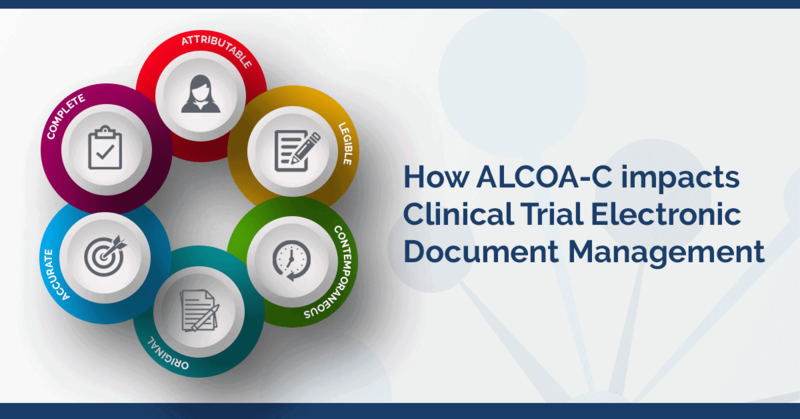 The critical aspect of the source documentation, and the reason the FDA and other regulatory bodies prioritize the quality of it, is because it is the crucial link that permits investigation and validation of the trial data at any time, by anyone. In addition to the data collected, good documentation also proves that ethical rights and subjects’ well-being have been respected. The U.S. Food and Drug Administration (FDA) became the first body to introduce standards in the form of ALCOA-C, with the EMA following suit and adding a few additional letters to the acronym. (Hey, regulatory bodies love standards!). Attributable: It should be clear who has documented the data. To drill down further, it should be clear who’s created the document and when. This also applies to changes and additional documentation. If a change is made to a document, it should be clear who made the change, when it was made, and why it was made. To ensure these standards are followed, your research team must have a working Delegation of Authority (DOA) Log. Florence eBinders simplifies DOA Logs by making them fully electronic with Part-11 compliant eSignatures. Learn more. A key benefit research teams find when moving to eRegulatory/eSource is automated and always-on audit trails. Site staff, monitors, and inspectors can easily see when a document was viewed/created/edited/signed, who performed the action, and why they performed the action. Legible: Readable and signatures identifiable. We’ve all encountered the document with written text that is impossible to make out. Is that a 6 or an 8? This is one of the common compliance risks research sites managing regulatory and source on paper encounters. With eRegulatory and eSource platforms like Florence eBinders, the risk of illegible documents is minimized, if not entirely eliminated, because of electronic formats and direct integrations with the EMR/EHR. Learn more about our integrations. Contemporaneous: Results should be recorded as they are observed, and signatures should be attached to a date when they occurred. If a clinical observation cannot be entered when made, chronology should be recorded. An acceptable amount of delay should be defined and justified. (Another area that always-on audit trails with Florence eBinders assist in ensuring). Original: Study record should be original and not a photocopy. If a copy is made it should be exact and attributed to who made the copy. The investigator should always keep the original source document. (Read our blog post coming soon about certified copies and electronic records). Accurate: The document and data should be accurate, real, and represent the facts. There should be a high level of honesty and accuracy in reporting, and documents should be double checked for accuracy. Complete: The document should be complete until that point in time. Enduring: Long-lasting and durable. Your documents should be able to be accessed and clearly read long after they are created. Florence eBinders ensures easy archiving and readability of completed studies with the ability to download complete binders if needed. Available and accessible: We’ve all been through monitoring visits where locating a file feels like a scavenger hunt. The EMA specifies that records should be easily available for review of treating physicians and during audits/inspections. The documents should be retrievable in a reasonable time. Florence eBinders enable this with simple and fully compliant monitor login capability, both on-site and remote. Consistent: Demonstrate the required attributes consistently. Credible: Based on real and reliable facts. Corroborated: The data should be backed up by evidence. Not a part of the Florence Family? Schedule a demo so we can show you why 4,500+ research sites are. We would love to welcome you to the Florence Network of sites maximizing their efficiency with Florence eBinders. Let’s schedule a personal demo together so our team can show you why sites love us so much they’ve made us the #1 eRegulatory solution.